Gisele Lagace is no stranger to comics or music. She’s an artist who has worked on a variety of music-themed books, such as Archie Meets The Ramones, as well as was a member of a rock band in the 1980s and 1990s. 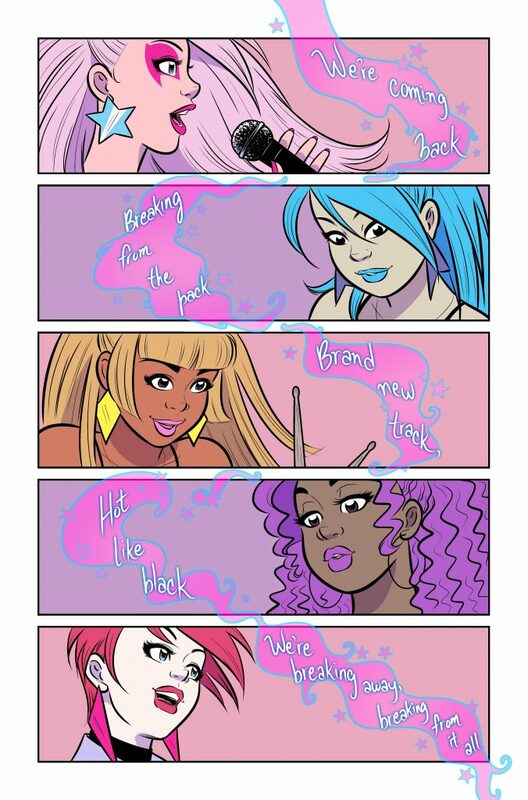 It’s no wonder, then, that working on a book like IDW’s Jem and the Holograms would be a perfect fit. 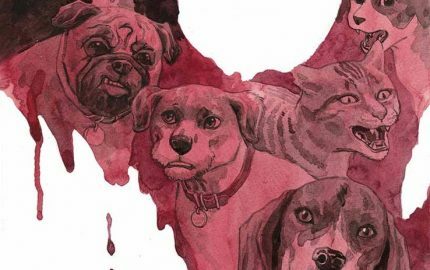 The artist has contributed a number of covers to several issues of the series, and she’s now helping usher out the comic with a bang by providing interiors to its final arc, starting this week with issue #24. Ms. Lagace spoke with me recently about contributing to series’ closing story, collaborating with series writer Kelly Thompson, and how her music background has informed her art. 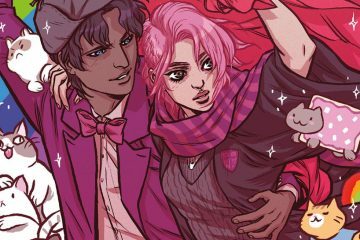 FreakSugar: I asked [former Jem artist] Sophie [Campbell] and [writer] Kelly [Thompson] this when I first interviewed them about the series, so I have to ask you, too: What are your memories of Jem? Were you a fan of the cartoon series? Gisele Lagace: I remember Jem quite well. It was a fun show. I was in high school when it came out, and oddly enough, that’s when I was also honing my craft as a musician to later do an all-girl band of my own in adulthood. 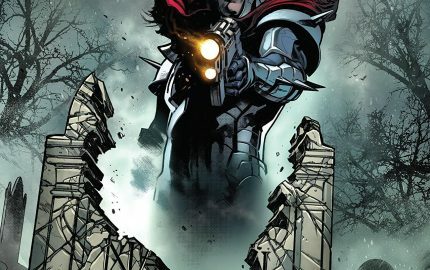 FS: I know you’ve contributed covers to the series, but how did you become involved with providing art for the last arc of the comic? 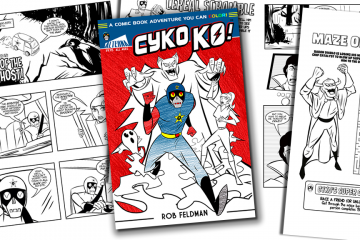 GL: I was simply asked, and I said “Yes!” Having worked on other music-themed comics, e.g. Archie Meets Ramones & Betty Boop, I felt I could probably pull this off. FS: How’s it feel to help usher out the series’ final journey? GL: It’s nice! I’m really happy I got to be a part of this series. I hope I do it justice! 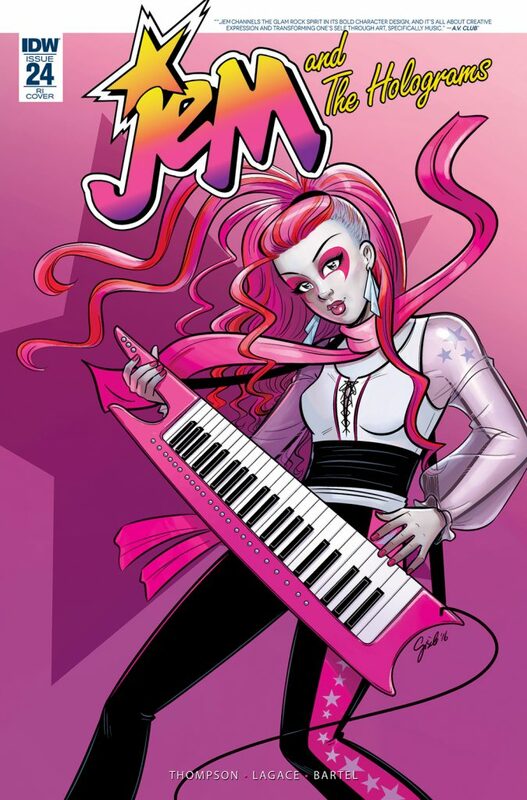 FS: Jem has such an ebullient, graphically interesting characters unlike anything we see anywhere else in comics. Was there anyone from the Jem universe you were particularly eager to tackle? GL: Ha-ha! That’s a “choose your favorite child” question! 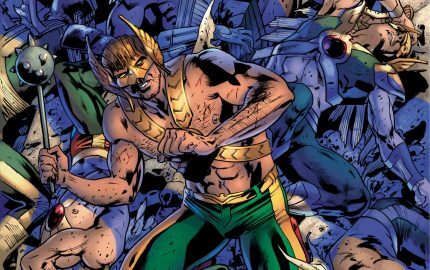 In general, I like to draw villains, so getting to draw The Stingers in this arc was really fun; Riot in particular. He’s so over-the-top with the drama in his life! 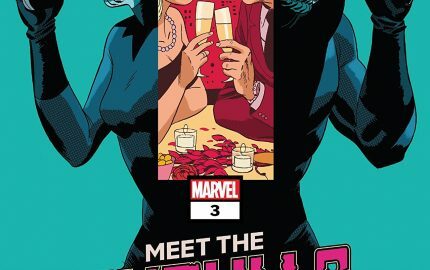 FS: Following up on that, the cast’s looks have changed so much over the 20+ issues of the series. Were there flourishes you wanted to add in the evolution of those looks? GL: I mostly tried to follow what Sophie Campbell had set in place at the start of the series. It’s not an easy task, I can tell you that! I hope people enjoy my interpretation of it. FS: Is there any particular music you listen to get you into the right frame of mind to draw Jem? GL: Ha-ha-ha! Readers would probably be shocked to know that Jem was drawn while I binged The Walking Dead, and when I listened to music, it was usually Rammstein. Their music is great to boost my energy. FS: Here’s a silly question, but it’s one I asked myself just now: If you could steal one of the cast’s looks, which cast member would it be? 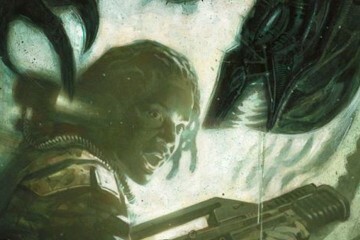 I’m going with Sophie Campbell’s redesign of Stormer. Her hair is amazing. GL: Shana all the way! I like big curly hair, and her choices of instruments to play are right up my alley. FS: What has been the collaborative process been like with Kelly? GL: It’s been good. I’m working from full scripts, and when I have question, she’s quick to reply. Sarah Gaydos, our editor, is also very quick to reply when I have questions. Good team. FS: I know you were in a band from the late 1980s to the early 1990s. What can you tell about that time? Do you still perform? GL: I was into music big time growing up. I was buying KISS and Van Halen albums as young as 8 years old. My main interests were always a combination of music and comics, but by the time I was a teenager, my love for music took over, and it became what I really wanted to do for quite a few years. In 1988, I moved to Montreal with my partner (who I’m still with, and also a musician) to try and make it in music (we were from a small town in New Brunswick.) Having been a big fan of Girlschool (a British all-girl band,) I decided to try and make an all-girl band of my own. I put ads up in papers, music & record stores to try and find band members. Within a month or two, I already had the first line-up. We went through a few band member changes, (even band name changes,) but eventually got signed for a record deal in 1991 as Barbarella, after performing on an American Idol-type show. It was a show where people in the music biz would invite newcomers to perform, and we got the spot, and that led to a record deal. I was more into metal music at the time but I knew that making a career in French in Montreal would require something a little softer, so I wrote songs that were a bit more radio friendly. Our producer helped me refine these songs, and our singer wrote lyrics to the melodies I had. The album also had two cover songs, one of which is “Lady Marmalade,” a familiar song to the English speaking world. We ended up touring the province of Quebec and other French regions of Canada for a couple years. While on tour, I was reading comics to past the time, and over time, I think my love for comics came back again, and I picked up a pencil to draw again after so many years away from it. FS: Following up on that, a lot of your work has involved characters in bands. Are there any specific memories or feelings from your time in a band that you draw on when you tackle a new project? GL: If it’s something I’ve written, I’ll certainly bring my own experiences to the table. I’m sure I could write a series just based off that. If I’m drawing something that someone else has written, and I feel something isn’t right, I’ll mention it, otherwise, I do the best I can with my knowledge of the field. 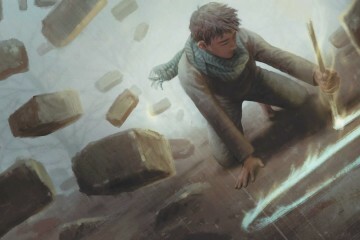 FS: After Jem wraps up, what projects can you talk about coming around the bend? 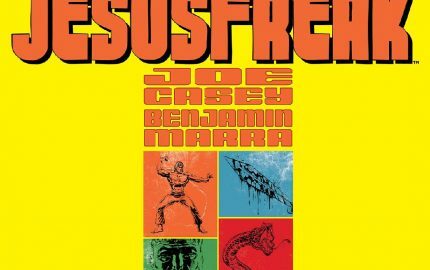 GL: Other than cover work and my own creator-owned projects (that I self-publish) I don’t have anything lined up for other publishers in terms of interiors. That could change tomorrow, though; you never know in this business! Best way to know what I’m up to is to follow me on Facebook/Twitter/etc. Links can be found at my website: giselelagace.com. 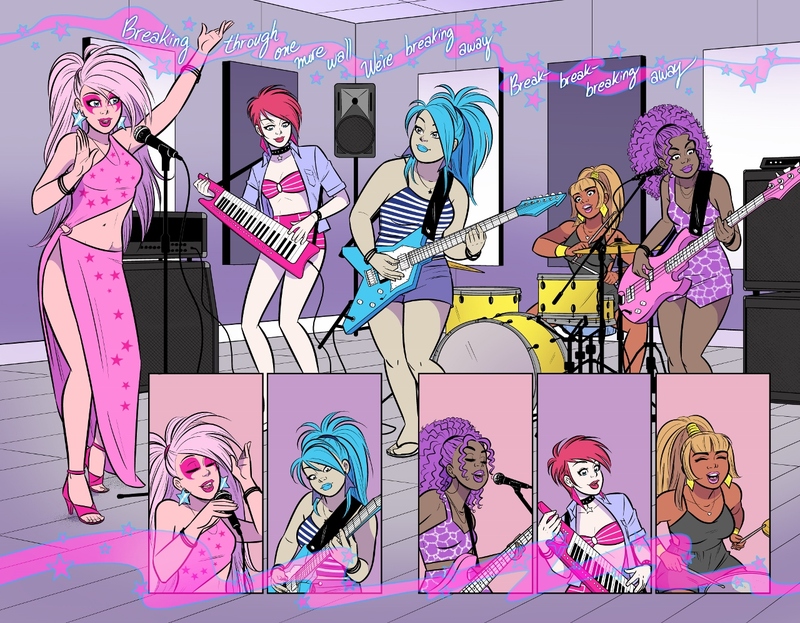 Jem and the Holograms #24—part one of “Truly Outrageous,” the final arc of the series—written by Kelly Thompson with Gisele Lagace on art, is on sale this Wednesday from IDW. Truly Outrageous Part One! 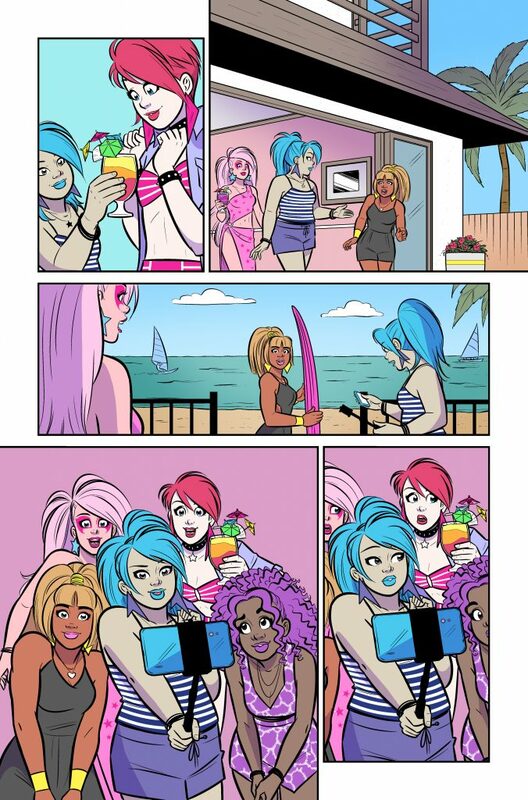 Jem and The Holograms head Hawaii to get away from it all, but with the Stingers not so coincidentally renting the beach house next door, nobody is going to be getting any rest or relaxation!